You got some .wmv files on PC and you'd like to play them on macOS High Sierra MacBook or iPhone iPad running iOS 11, you are recommended to convert these .wmv files to HEVC format. Compatibility is the main reason why we choose to convert WMV to HEVC (also H.265). WMV developed by Microsoft in 1999 is commonly used with ASF container format and supported by most Microsoft devices, Android phones and tablets. Other devices such as Apple products iPhone iPad Apple TV Mac computers don't accept WMV files. While HEVC that tends to replace H.264 becomes widely supported after the arrival of iOS 11 and macOS High Sierra that add support for the HEVC codec. WMV to HEVC conversion can be easily done, with the right converter tool. This page will give you a step-by-step guide on how to convert WMV to HEVC (H.265). There're many online tools offering access to convert WMV to HEVC online for "free". But you'll receive the message saying "file is too large" the source file size is larger than 100MB. Open source video transcoder Handbrake allows you to free convert WMV to HEVC, but if you use it to convert 4K files, the speed can be very disappointing. 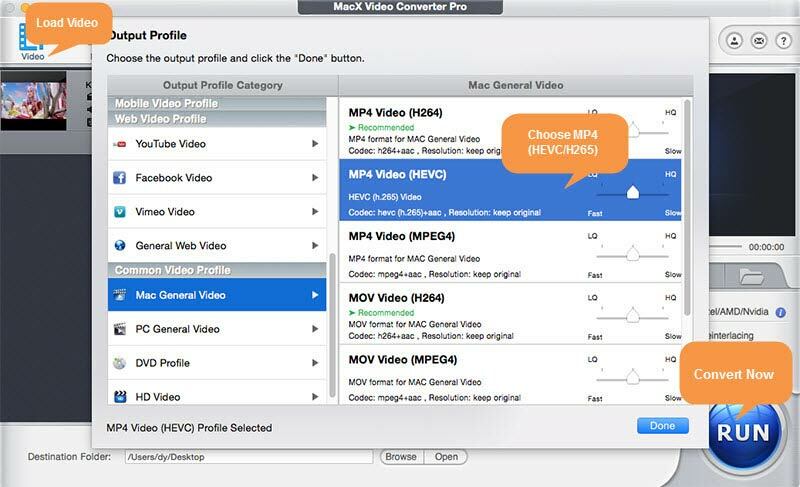 MacX Video Converter Pro is the best performing WMV to HEVC converter, and we list its key features below for your reference. High-Quality Engine promises nearly zero quality loss during WMV to HEVC conversion process. HT tech and hardware acceleration tech, and multi-core CPU processing helps you convert WMV to HEVC at 5X faster speed than Handbrake does. Convert WMV to HEVC with preset profiles for iPhone X, iPhone 8/Plus/7/6s, Apple TV, Android and tons of other devices. Built in 370+ video audio codecs, it can also convert WMV to MOV/MP4, H.264 to H.265, HEVC to H.264, VP8 to VP9, MKV to MP4, you name it. Step 1: Add source WMV video. Launch the WMV to HEVC converter software on your computer (the latest macOS High Sierra also supported). Click the Videos icon at the top and a window will pop up, allowing you to select source WMV videos. You can add more than one WMV video at a time as the program supports batch WMV to HEVC conversion. Here's an easier way to load source video, just drag and drop the file to the interface. Step 2: Select HEVC as output format. Once the source video is loaded, you'll see the Output Profile Window. Select Mac General Video on the left side of the window, and find MP4 Video (HEVC) and select it. It is MP4 video container format with HEVC/H.265 video codec and AAC codec. The MP4 container format is recommended because of its good compatibility. Click the Settings icon , and you'll get more video and audio options before you begin the WMV to HEVC conversion, like video resolution, frame rate, bit rate, etc. It also works as a 4K video resolution converter, allowing users to convert 4K to 1080p, 1080p to 720p, or upscale 1080p to 4K 2160p for 4K UHD TVs and other 4K devices. Step 3: Click RUN button at the bottom to process WMV to H.265/HEVC conversion. The time it takes to finish the conversion process also depends on the source file size. If you are using the free trial version of the WMV to HEVC converter, you have to wait five seconds before it starts the conversion job. It's the same to convert WMV to MOV, HEVC to H.264, AVI to HEVC, VOB to HEVC, MKV to MP4, and more. HEVC has distinct advantages over WMV and is a leading video codec because of its extremely high compression efficiency. While WMV has fallen out of popular use these years, and you won't see ASF video files much anymore. More details are listed in the table below. WMV, short for Windows Media Video, was developed by Microsoft for internet streaming applications. HEVC (High Efficiency Video Coding), also H.265, is the successor to H.264, which doubles data compression ratio. Some iPhone iPad models, iPod touch, Samsung Galaxy Note 8/S7 etc. Free download the fastest HEVC video converter to transcode WMV to HEVC/H.265 with 98% quality reserved. It also provides you with 350+ mobile device profiles to convert WMV to HEVC iPhone iPad Android Microsoft, game console with best HEVC resolution and frame rate default settings.